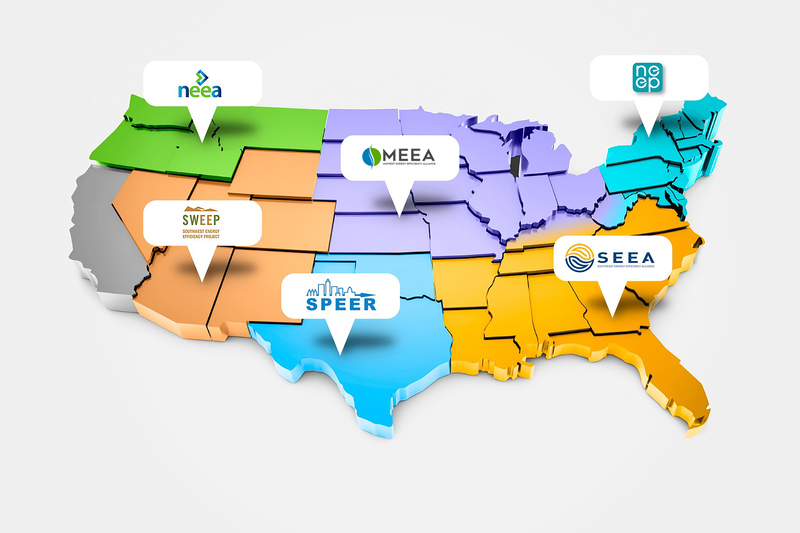 MEEA is part of a national network of regional energy efficiency organizations (REEOs). The REEOs work through funded partnerships with the U.S. Department of Energy (DOE). Collaborations with utilities, third‐party program administrators, public officials, advocacy groups, businesses and foundations increase the reach of the REEOs. These partnerships are key to helping state and local governments scale energy efficiency and achieve cost-effective energy efficiency by 2020. The REEOs additionally provide technical assistance to states and municipalities supporting energy efficiency policy development and adoption. The Northwest Energy Efficiency Alliance (NEEA) works on behalf of more than 12 million energy consumers, working with an alliance of more than 100 Northwest utilities and energy efficiency organizations. NEEA leverages its strong regional partnerships to effect market transformation by accelerating the adoption of energy-efficient products, services and practices. The Northeast Energy Efficiency Partnerships (NEEP) was founded in 1996 and serves the Northeast and Mid-Atlantic to accelerate energy efficiency. Working in the building sector through public policy, program strategies and education, NEEP’s vision is of a region that fully embraces energy efficiency as a cornerstone of sustainable energy policy, helping to achieve a cleaner environment and a more reliable and affordable energy system. The Southeast Energy Efficiency Alliance (SEEA) drives market transformation in the Southeast’s energy efficiency sector. Through collaborative public policy, thought leadership, programs and technical advisory services SEEA promotes energy efficiency as a catalyst for economic growth, workforce development and energy security across 11 southeastern states. These states include Alabama, Arkansas, Florida, Georgia, Kentucky, Louisiana, Mississippi, North Carolina, South Carolina, Tennessee and Virginia. The Southwest Energy Efficiency Project (SWEEP) advances energy efficiency in Arizona, Colorado, Nevada, New Mexico, Utah and Wyoming. Traditionally a high growth region where energy efficiency efforts were lagging, SWEEP has a record of success: the non-profit helped to increase funding for electric utility energy efficiency and load management programs in the Southwest from $21 million in 2001 to $375 million in 2013. The South-central Partnership for Energy Efficiency as a Resource (SPEER), the newest regional energy efficiency organization, aims to accelerate the adoption of advanced building systems and energy efficient products and services in Texas and Oklahoma. These two states include nearly 30 million people and more than half of the fastest growing cities in America. SPEER is a member-based organization with 40 members, including manufacturers, utilities, energy services companies, non-profits, cities, universities and more.